RRB Recruitment 2018: Railways hiring for 91, 307 vacancies across various posts: RRB Recruitment, Railways Recruitment Board Jobs,RRC Recruitment Important Dates, RRB Group D Posts,RRRB Group C Level I Posts, RRB Group II Level Posts,RRB Group C Posts. Railway Recruitment Board, RRB has released multiple notifications for filling 91, 307 vacancies across various posts. The vacancies range from Assistant Loco Pilot to Technicians to Apprentice. The application for all the vacancies is currently under process and candidates interested can fill the online application forms. Please note, while two of the above recruitment is on all India level, Apprentice recruitment is only for Eastern Central Railways. Indian Railways RRB Exam Date: No Exams in April/May 2018 for CEN 01/2018 & CEN 02/2018: Indian Railways RRB Exam Date 2018 update has been released by the Railway Recruitment Boards (RRBs) after no exams were conducted in the month of April/May 2018 for the much anticipated Indian Railways Recruitment Drive 2018 for Group D, and Assistant Loco Pilot/Technician posts. The Indian Railways had released Advertisements CEN 01/2018 & CEN 02/2018 in February 2018, earlier this year inviting applications to fill approximately 90,000 vacancies for which about 2.37 Crore applications were received by the Railway Recruitment Boards (RRBs). As per these advertisements, Indian Railways had tentatively planned to organize the Computer Based Test (CBT) in the months of April and May 2018; however, no exam was conducted due to the mammoth of applications received by RRBs. The Railway Recruitment Board (RRB) extended the last date for the online registration process of Group D and for assistant loco pilots and technicians posts to the end of March. The last date to apply for these posts was March 5 and 12, 2018, however, due to change in eligibility criteria for Class 10th only, Railways Minister Piyush Goyal had indicated an extension of the deadline. Candidates who have not applied until now can follow the instructions below and apply online on or before March 31, 2018. Blind Candidates: Moreover, the railway ministry recently told the Delhi high court that it will allow blind candidates to appear in its recruitment examinations. The response came on a plea by National Federation of the Blind challenging two recent notifications according to which the blind were barred from appearing for the railways' recruitment exams, as reported by HT. RRB Recruitment: RRB has released two Centralized Employment Notifications or CEN namely CEN 01/2018 for 26, 502 vacancies and CEN 02/2018 for 62,907 posts. The last date to apply for each is also provided below. Candidates interested in applying for jobs in the Indian Railways can go through the details provided and at the links which are provided in subsequent links. Minimum Educational Qualification: Candidates within the age group who have secured a minimum 50 percent in their Class X examinations and have the requisite ITI certification for the respective apprenticeship can apply online. Selection Process: On the basis of merit list made out of Class 10 and ITI marks. Candidates can check eligibility, age limit, educational qualifications and steps on how to apply for 1898 Apprentice Posts in East Central Railways here. Educational Qualification: Candidates are required to have completed their matriculation examination along with necessary ITI diplomas in engineering for the posts. Candidates are advised to check the detailed notification for checking the eligibility of the various posts and the details of vacancy for different RRBs. Selection Process: Selection would be done on the basis of an examination. The ALP positions would be done over two steps of CBT or Computer Based Test. A single stage CBT would be conducted for Technician positions. Check the details of the vacancy, educational qualifications, important dates along with steps to apply online for ALP and Technician posts here. Educational Qualification: Candidates are required to have completed their matriculation examination along with necessary ITI certification for apprenticeship posts. Candidates with engineering degrees are not eligible to apply under apprenticeship act. Also, candidates who are still appearing in the examination or waiting for their final results are not eligible to apply. All candidates are requested to go through the detailed notification to check respective educational and eligibility requirements for various posts before applying. Selection Process: Selection would be done on the basis of a Computer Based Test. Details and dates of the CBT would be provided at a later date. Tentatively, the examination would be conducted in April/May 2018. 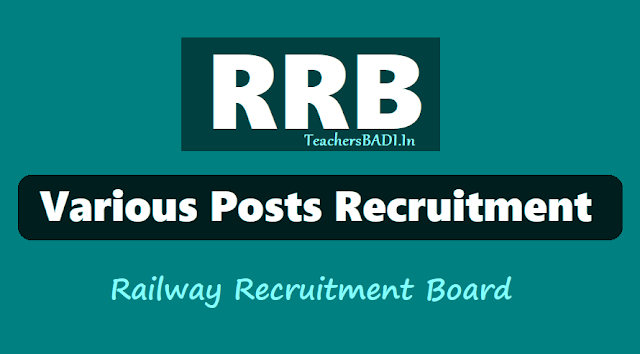 Check the details of the vacancy, educational qualifications, important dates along with steps to apply online for RRB Group D posts. RRB recruitment drive: Online applications have been invited through Railway Recruitment Board (RRB) for the Group C Level II posts like Assistant Loco Pilots, Technicians (Fitter, Crane Driver, Blacksmith, and Carpenter) and Group C Level I (Erstwhile Group D) posts like Track maintainer, Points man, Helper, Gateman, Porter. This RRB recruitment drive is open for candidates who have passed Class Xth & ITI for Group C Level I posts and Class Xth & ITI or diploma in engineering or a graduation in engineering for Group C Level II posts like Assistant Loco Pilots, Technicians and aspire to join Indian Railways. Interested candidates with class 10 to engineering qualifications may visit Railway Recruitment Board (RRB) websites to complete the application formalities. Online applications have been invited for the Group C Level II posts like Assistant Loco Pilots, Technicians (Fitter, Crane Driver, Blacksmith, and Carpenter) and Group C Level I (Erstwhile Group D) posts like Track maintainer, Points man, Helper, Gateman, Porter. This recruitment drive is open for candidates who have passed Class 10 and ITI for Group C Level I posts, and Class 10 and ITI or diploma in engineering or a graduation in engineering for Group C Level II posts like Assistant Loco Pilots, Technicians and aspire to join Indian Railways. Indian Railways has decided to increase the upper age limit for Assistant Loco Pilot (ALP), Technician posts to 30 years (unreserved category), 33 years (OBC non creamy layer)and 35 years (SC and ST category).